Local and national experts shared with over 300 people during the 2018 Utah Trafficking in Persons Conference held Monday, September 10th. Among the attendees this year were service providers, law enforcement officers, collaborative partners, prosecutors, court staff, trafficking survivors, community members, and many others. This year the conference focused on recognizing and using protective factors for victims in the aftermath of trafficking as well as address common complications with human trafficking cases. The conference hosted several experts from law enforcement, the medical field, behavioral health, and more to address best practices in Utah that benefit every field or specialized interest. Poetry, art exhibits, and live presentations by trafficking survivors gave the audience a clear understanding of why outreach, case management, treatment, and long-term self-sufficiency services are critical for those who’ve been exploited in our communities. Photo: Youth human trafficking survivor, Sol, shares her story at the 2018 UTIP Conference. 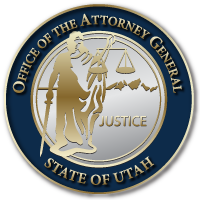 This entry was posted in Recent Posts and tagged Human Trafficking, Utah Attorney General, Utah Trafficking in Persons Task Force, UTIP on September 21, 2018 .